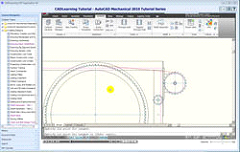 Our AutoCAD® Mechanical 2010 Training includes training for AutoCAD 2010. AutoCAD Mechanical is a design and drafting tool for manufacturing, and is used to accelerate the mechanical design process. Our AutoCAD Mechanical training will show you how to work more efficiently and teach you to save hours of design time by automating common design tasks.